Your quote: "Companies are all about profit. Without profit, they cannot exist." They existed just fine without profits as publicly traded companies. And that's assuming one even considers companies that actively take on billions of debt to be "profitable" instead of just engaging in creative EPS accounting. They had to borrow money so they could grow enough to be profitable. Profits are still the goal. If they were unable to borrow, they would have closed up shop. Selling shares (going public) helped raise money to stay afloat. If you are not profitable or seen as on your way there, investors are less likely to buy your stocks or loan you money. Yes, they can, thanks to super loose monetary policy. Zombie companies that are kept in business solely by the money printer, not because they're profitable, productive companies. One could deduce that such zombie companies are kept afloat for other reasons like being "Agenda friendly" social engineering tools. Talk to people about liberty. You won't find it on websites, you won't find it in politicians. Visiting the Outer Banks of NC? Or because they kick enough of their corporate welfare back to politicians. Or both. Stupid Trump lackey. If they don’t go to Harvard, then they can’t be qualified. Harvard bankers are the smartest. Hmmm. Ok, maybe he does have an education that many bankers are not smart enough to get. But he needs some experience! He’s just a pizza guy! Hmmm. Well, that was just Kansas. Backwards flyover country. What major Wall St. banking and brokerage firm did he work for? Does he actually know how to best utilize debt and money lending? Does he know how to offset monetary inflation with labor supply inflation? Why not just put Oprah on the Fed using that logic? She is successful and can pretend she knows something about a topic she knows nothing about. I am in favor of putting people who have devoted their life to the topic of monetary policy and have a track record of being right in the past. Trump's choices fit neither of those criteria. More evidence that MAGA surrounds himself with the best of the best, perhaps the best pick since he picked America-Firster John Bolton. This should also help debunk theories that MAGA was a fraud & plant of Israel First lobbies neocons. Herman Cain: Anyone who messes with Israel, messes with the U.S.
Don't people understand that Herman Cain already was a Federal Reserve Chair??? It's not like he's some pizza CEO hired off the street. I don't know if he's really a "gold bug" or if that's just the narrative being sold but Cain was previously Chair of the FedRes of Kansas City-Omaha. Wow. I didn’t know that Oprah has advanced STEM degrees and actual Federal Reserve experience. If that’s the case, then she might be as qualified as Herman Cain. Last week, President Donald Trump set the economics community aflame by suggesting that he will appoint businessman and presidential aspirant Herman Cain to the Federal Reserve Board. Even more than political economist Stephen Moore, the critics maintain, Cain represents a threat to the cabal that has controlled the central bank for decades. Why? Because Cain is a successful executive who founded a real business, took risks, and created jobs, things most academic economists will never ever do. Media outlets and other allied constituencies have howled with rage at the prospect of President Trump “packing the Fed,” a distant reference to attempts by President Franklin D. Roosevelt to pack the Supreme Court in the 1930s. Those worried about the independence of the Federal Reserve Board should reconsider. Independence from what exactly? While the Fed is meant to be independent from the executive branch on a day-to-day basis, it is certainly not independent of Congress or the law. Yet the Fed in recent years has shown a troubling tendency to deviate from its legal mandate and make up new authorities to fit the changing economic situation. Case in point: the dubious notion that we should seek a 2 percent rate of inflation. Anybody who cares to read the 1978 Humphrey Hawkins law will know that the Fed is directed by Congress to seek full employment and then zero inflation. Not 2 percent, but zero. Yet going back a decade and more, the Fed, led by luminaries such as Janet Yellen and Ben Bernanke, has advanced a policy of actively embracing inflation. And neither Bernanke nor Yellen bothered to consult Congress when they decided to discard their legal responsibilities. Quantitative easing, to take another example, represents a vast inflation of the financial markets and housing, yet Fed officials actually appear in public and talk about the conundrum presented by “low inflation.” The inflation in home prices that occurred during and after the Fed’s purchase of trillions in securities has permanently raised the price of housing in many parts of the country, preventing millions from purchasing homes. Yellen confesses to be “perplexed” by the dearth of home purchases by young families, but she is the cause of the malady. Not only are these pro-inflation policies in violation of the letter of the Humphrey Hawkins law, but they have contributed to increased volatility in the financial markets. The third and frequently forgotten mandate in the Humphrey Hawkins law commands the Fed to employ policies that will produce “stable interest rates.” But the economists have long since stopped talking about this. The basic problem with the Fed today is that it has gradually fashioned a new set of rules for itself, particularly since 2008, on which Congress has never been consulted. In the same way that economists use their imaginations to concoct new theories about economic behavior, the Fed board has apparently decided to take up legislative powers as well. Is the Fed meant to be free of any real-world restraint on its actions. One may wonder whether Fed independence is a technical or a political question. It is political. The nature and behavior of money is always political, no matter how much technical effort at measuring and modeling economic factors there may be. For example, the Fed over the last decade systematically took money away from savers and gave it to leveraged speculators by enforcing negative real interest rates. Taking money from some people to give it to others is a political act. That is why the Fed, like every other part of the government, should exist in a network of checks and balances and accountability. The biggest problem facing the financial markets today is that the folks at the Fed have no appreciation for how their policies are affecting the real economy. Ten years of inflation, open market manipulation, and other experiments have left the U.S. burdened with trillions of dollars in new public and private debt. The December market break was a direct result of the fact that Fed officials do not really understand the real-world consequences of their actions. Take another example: U.S. financial institutions are facing years of lower profits as funding costs for banks normalize thanks to Fed manipulation. Yet asset returns for banks and investors will remain suppressed by “extraordinary” monetary policy. Are these massive distortions in the financial markets authorized by Congress? No they are not. When investors in bank stocks have to watch the net interest income for the industry contract, one wonders what our friends on the Federal Reserve Board will say. Moreover, the Fed’s decision to use excess reserves and repurchase agreements to manage short-term interest rates amounts to the nationalization of heretofore private markets. Is this authorized by Congress? No it is not. Instead the Fed is extending its government-sponsored monopoly over the short-term money markets with little regard for the rights of private investors and financial institutions. We should be worried about Fed independence, but not because the central bank is somehow suffering under the tyranny of the executive branch. Rather the Federal Reserve is out of control, acting in ways and with powers that were never granted to it. Quantitative easing, “Operation Twist,” and the explicit 2 percent inflation target are just three example of how the Federal Reserve Board is operating outside of its legal authority. It’s high time that President Trump put some new faces at the Fed and started asking questions about what policies it follows and why. Central banks don't sell (they can- but rarely) or short gold. Link claiming they do? Our own Federal Reserve doesn't even own any gold (it belongs to the US Treasury). The fed shows gold certificates on its balance sheet therefore it has a claim on gold... On the contrary if the treasury has gold theres a good chance its owned by the private bankers... who pays you to spread such misinformation? youre the epitome of fake news lots of times man... theres gotta be an investigation into this. I'm no fan of Cain but if Trump is using him as an attack against the Fed it seems to be making all the right people mad. Does the Federal Reserve own or hold gold? The Federal Reserve does not own gold. The Gold Reserve Act of 1934 required the Federal Reserve System to transfer ownership of all of its gold to the Department of the Treasury. In exchange, the Secretary of the Treasury issued gold certificates to the Federal Reserve for the amount of gold transferred at the then-applicable statutory price for gold held by the Treasury. Gold certificates are denominated in U.S. dollars. Their value is based on the statutory price for gold at the time the certificates are issued. Gold certificates do not give the Federal Reserve any right to redeem the certificates for gold. ben bernanke admits tbe fed holds gold... again I think its easy enough to infer who pays you to put up the misinformation you do and its pretty evident youre a different person than the other zippyjuan ive been intimate with. so whats going on? why not just level with everybody? Zip does the legal differentiation between "custodian" of the gold and "ownership" of the gold (in line with the Fed's official statement), though for the purposes of trust administration custody of property as trustee is ownership, but with supposed responsibility to maintain the property for the benefit of who it is being held on behalf of. Just legalese word games. Exactly right. The New York Fed just has all that gold, and so much German gold, and half a dozen other nations' gold, in their basement for ballast. Don't want the building to capsize in a storm! Practically the entire economic system functions on the trust administration system (In God We TRUST! And the sheep think it means trust like faith in something...nope, means trust administration). Learn trusts and estates to unlock the keys (hehe Vatican) to how the system really operates at all levels. Everything, including us, is considered property under trust administration. Yes, the Fed stores the gold- but it does not own any of it. Like if you put something in a safe deposit box at the bank- they are holding for you but don't own it. It still belongs to you. And like a safe deposit box, the bank can seize the contents of the box, that they are custodian of, for various reasons, including being in debt to that bank. For all intents and purposes once a trustee/custodian takes control of property the trustee/custodian becomes legal owner. A trustee can be a natural person, a business entity or a public body. A trust in the United States may be subject to federal and state taxation. A trust is created by a settlor, who transfers title to some or all of his or her property to a trustee, who then holds title to that property in trust for the benefit of the beneficiaries. While the trustee is given legal title to the trust property, in accepting the property title, the trustee owes a number of fiduciary duties to the beneficiaries. A gold certificate is a receipt for gold received to be held in trust. If the Fed holds any physical gold in trust for others then the Fed owns that gold legally. If the Fed transferred gold it previously held to the Treasury in exchange for gold certificates then the Treasury owns that gold. That is the general gist but is subject to specific terms of the transfers if stated in a contract. Last edited by devil21; 04-10-2019 at 02:53 PM. Being a custodian does not give you control of an asset unless it was set up specifically as a trust. The custodian is responsible for protecting the asset but beyond that cannot do anything it wants with it. A bank can't just clean out your safe deposit box or bank account if they want to. The owner gets to make those decisions (though the custodian may be asked to make any such actions). The Fed is custodian, not trustee, of the Treasury's gold. What Is the Difference Between a Trustee & a Custodian? A trustee manages assets for the beneficiaries of a trust, estate or other party. A custodian is the organization that actually holds the assets. A trustee can leave the assets in the custody of a bank or other institution. The bank secures the assets, but as a custodian it does not receive authority to make management decisions, such as which stocks or bonds to purchase with the money in the trust. The custodian holds the asset. The trustee controls it. The Fed is custodian and the Treasury is trustee. Last edited by Zippyjuan; 04-10-2019 at 03:28 PM. Share a link to the legal agreement that the Fed is solely custodian and not trustee? That is the $200 billion question, after all. And yes, if the contract entered into with a bank says the bank can do whatever it wants with the box contents then it can, indeed, do whatever it wants with it or whatever is instructed to do by other entities. If there is no ownership conferred then how can a bank seize the contents of a box for various reasons? It wouldn't have legal authority to do so and would be required to not honor any such demands by, say, a tax collector or the whims of the legislature. And yes, if the contract entered into with a bank says the bank can do whatever it wants with the box contents then it can, indeed, do whatever it wants with it or whatever is instructed to do by other entities. If there is no ownership conferred then how can a bank seize the contents of a box for various reasons? It wouldn't have legal authority to do so. Although the Federal Reserve does not own any gold, the Federal Reserve Bank of New York acts as the custodian of gold owned by account holders such as the U.S. government, foreign governments, other central banks, and official international organizations. No individuals or private sector entities are permitted to store gold in the vault of the Federal Reserve Bank of New York or at any Federal Reserve Bank. A small portion of the gold held by the U.S. Treasury (roughly $600 million in book value)--about five percent--is held in custody for the Treasury by the Federal Reserve Banks, as fiscal agents of the United States. The vast majority of this gold is located in the vault at the Federal Reserve Bank of New York, and a very small portion is on display in several Federal Reserve Banks. The remaining 95 percent of U.S. Treasury gold ($10.4 billion in book value) is held in custody for the Treasury by the U.S. Mint. That's not a legal contract specifying terms. That's a website FAQ. Last edited by devil21; 04-10-2019 at 03:40 PM. Show us the legal contract establishing the Fed as a trustee for the US gold reserves. The Fed says they are custodian. You claim trustee. Show us your evidence. hereby vested in the United States; and in payment therefor credits 'resnentsi. See if you can find "trustee" anywhere in the act. The "book value" in this case is the price of the asset at the time it was purchased. If you bought a car for $15,000, you receipt shows that $15,000. It does not change as the value of the car goes up or down. It is the price paid. The notes the Fed was given in exchange for the gold cannot be sold or redeemed for anything. They are simply receipts. The title was transferred over to a new entity- the Treasury. They just keep the car parked in the Fed's garage. It is actually pointless that the value of the certificates are still kept listed on the Fed balance sheet. Last edited by Zippyjuan; 04-10-2019 at 05:05 PM. A STEM degree means nothing for this job. I assure you I was a far better student than Herman Cain but that doesn't mean I am qualified. 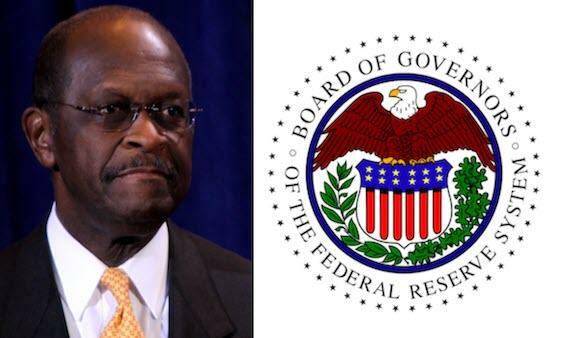 I don't care if care if Herman Cain has Federal Reserve experience. That means nothing to me. I have listened to Herman Cain talk about economic matters and I remember his answers from the debates on the Federal Reserve. He knows nothing. There are so many economists that would be actual, real choices. Joe Salerno from the Mises Institute knows infinitely more about monetary policy than Herman Cain. Larry White is a gold standard guy who went to Harvard and worked for the Federal Reserve. He actually devoted his life to monetary policy. Pick him. George Selgin went to NYU and is another person who spent his life studying monetary policy. And Steve Moore is almost as bad, but at least he is sort of an economist. A 5th tier economist. But an economist at least. Why not pick the best candidates? You have to know Herman Cain is not the best and the brightest for this job. Thanks for fetching that. I always appreciate your eagerness to provide information when challenged. It helps a lot with unwinding this twisted web of legalese that the bankers have devised. Herman Cain Fox NewsGal Says "Herman Cain Supports A Return To The Gold Standard"
Herman Cain Herman Cain: "Yes, I believe in the gold standard." Herman Cain: "Yes, I believe in the gold standard."